- We can pick up from the airport and arrange tours,book trian & flight tickets. -Offer food for the group . 365 Inn is centrally located about 10 minutes' walk from Chairman Mao's Mausoleum and Tiananmen Square. 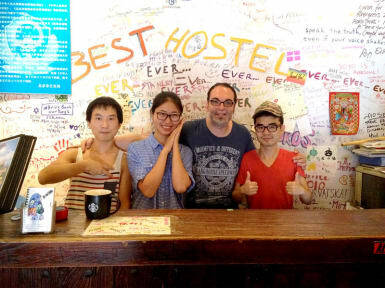 This comfortable hostel has an onsite bar serving tasty Western and local cuisine as well as budget-friendly drinks. Hostelworld guests have said they'd definitely stay here again, citing the staff, who are 'very friendly and kind and always there to help'. One visitor told us 'It has a place to party, it has a place to read, it has a place to rest; to be honest there is a place for everyone in 365 Inn'. We like their large, clean, hot and high-pressure showers. 365 Inn— is housed in a building with over 150 years of history, where the modern walls meet the old pillars from the time of its construction. Staying with us is to live inside Beijing as a Beijing Citizen, a true experience that cannot be missed. Excellently located in the heart of city, we — 365 Inn, provide you with the perfect base for sightseeing by day and partying by night. All of Beijing major hot spots are easily accessible on foot, thus saving you the cab fare home at night. Even you can’t miss the tours we offered to less tourists section of the Chinese Wall. Or just have a cup of coffee to relax by sitting out side of 365 inn and shower the sunshine. For Chinese mainland, there is a configured local policy of Beijing: If you prefer to stay in a dorm room, please book ALL BEDS in a same dorm as private even you are solo , or just please book the private room instead. thanks for all of your understanding. I really enjoyed my stay at 365 Inn. It was very central and close to a lot of famous sights as well as the subway. My shared room was clean, comfortable, and fairly spacious as was the restroom. The bar and restaurant was nice to relax in after long days walking for 12+ hours. I enjoyed sipping a drink and sitting on the front deck, watching the street. The staff was all very friendly and I had no issues. In a great part of Beijing! I loved my stay! Pros: Showers feel great and are spacious Location and Price!! Beds are decently comfy Cons: Needs more bathrooms and showers Those sleeping in top bunks have no electrical outlet near their beds...this is by far my biggest gripe!! This place has no general lounging are for its guests. Youre either in your room, in the bar on the main floor, or out and about hanging. The staff was not the most helpful with helping me plan my day trips for sightseeing and advice regarding touring and weather. Good hostel. Excellent location!!! Was pretty noisy in the mornings and the doors are paper thin. Bathrooms are standard. Good place for expats to hang out and have drinks in the front area but the breakfast took forever to get and wasn’t good. Enjoyed my stay overall. Very good location. Big room, decent showering facilities. Lacking a communal area as the bar by the main reception is open to the public so it doesn't have that hostel feel. My wallet got stolen (not related to the hostel) with all my band card , ID and room key inside. When I checked out I had to pay 50rmb for the missing key. I get there's a policy but some compassion in this scenario would have gone a long way. Only reason I wouldn't go back. Perfect location, helpful staff. If you are planning to cook, expect a tiny (and not neat) kitchen. We were travelling as a mixed group of 4. Whilst in China we stopped in a few hostel. The 365 is really we positioned for the forbidden city and surrounding area. There are plenty of places for shopping and eating near by. We only stopped for a couple of nights. I got the impression that the 365 was a bar and the hostel side of the business was a secondary concern. Compared to other places we stopped the bar was very expensive. Nice bar downstairs that was open late which was good. My room however had a padlock on the outside as the only way to lock it. So if someone was inside you couldn't lock it. Not ideal because anyone could come and go.